A widely-distributed neotropical species, with geographically differentiated forms ranging from the southern U. S. throughout the Antilles and Central America to subtropical southern South America. Etymology: Dryas ("oak") a son of Ares, and brother of Tereus, was one of the Calydonian hunters. He was murdered by his own brother, who had received an oracle, that his son Itys should fall by the hand of a relative (DRYAS). Julia is of latin origin, and its meaning is youthful. Feminine form of Julius (IULIA). Early stages: Eggs are yellow and approximately 1.2 x 1 mm (h x w). Females place eggs singly in diverse parts of the host plant mostly on leaves, growing shoots, or even off the plant. Mature larvae have a brown body with red and white stripes and black and yellow scoli and a brown and white head; length is approximately 0.9 cm. Caterpillars can be gregarious in small numbers (Brown, 1981). 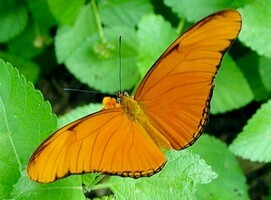 Dryas iulia fly rapidly in forest clearings and open areas. Females mate multiply, and adults roost at night in loose groups lower than 2 m above the ground (Brown, 1981). Hostplant: D. iulia larvae feed primarily on plants from the genus Passiflora subgenus Astrophea and Polyanthea, Tryphostemmatoides and Plectostemma (Brown, 1981). Davies N, and Bermingham E. 2002. The historical biogeography of two Caribbean butterflies (Lepidoptera: Heliconiidae) as inferred from genetic variation at multiple loci. Evolution 56: 573-589. Page: Tree of Life Dryas Huebner 1807. 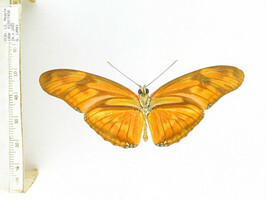 Dryas iulia (Fabricius 1775). Authored by Margarita Beltrán and Andrew V. Z. Brower. The TEXT of this page is licensed under the Creative Commons Attribution-NonCommercial-ShareAlike License - Version 3.0. Note that images and other media featured on this page are each governed by their own license, and they may or may not be available for reuse. Click on an image or a media link to access the media data window, which provides the relevant licensing information. For the general terms and conditions of ToL material reuse and redistribution, please see the Tree of Life Copyright Policies.